Whale watching season has taken off at Zamami Bay. 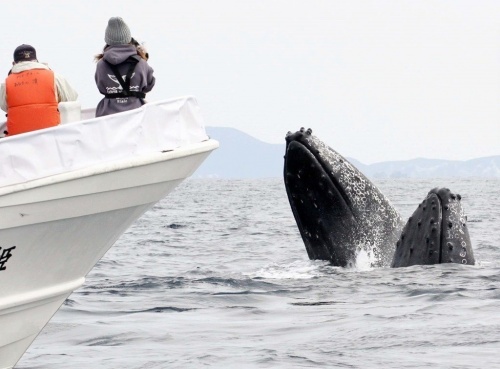 Two large humpback whales were spotted from a whale watching boat on February 18. They occasionally peeked their heads above the water and swam together playfully. In the morning, there was only one humpback whale. In the afternoon, a second whale appeared. The two whales were seen raising their heads above the water together. Occasionally a whale blow was spotted right next to the boat. The two-hour tour, which had participants from all over the world, was filled with excitement. Whale-watching tours hosted by the Zamami Whale Watching Association will continue until April 5. However, visitors are advised to plan their tours early, as the number of whales will decrease during the latter half of the season.